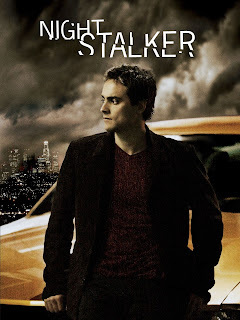 Chris Stachiw and Mike White return to the 2005 version of Night Stalker wherein Carl Kolchak (Stuart Townsend) goes toe-to-toe with cult leader Damon Caylor (Tony Curran). The episode was written by Thomas Schnauz (Better Call Saul) and directed by Rob Bowman (Reign of Fire). With all do respect, if the majority of this podcast retrospective is going to be like this episode, why not make an effort and do 2 episodes per month (at least when it comes to the classic Kolchak ones which are in the double digits anyway)? I really don't see how you wouldn't be able to find time for that. One hour more per month to see the episode and half an hour more to talk about it. As for this second new Kolchak episode, it's bargain bin X-Files, the new Kolchak as a character is thinner than cardboard and has less charisma than scented paper, his sidekick chick is also uninteresting yet steals the show from him. It's a mess all around. No wonder they killed it midway through with dreck like this and the pilot. The last episode "What's the frequency, Kolchak" should have been the pilot and the entire show had to be at least as good as that to make it.